DUE IN 5/12 This item is out of stock. We should get more by May 12th. Please check back then. You Can Now Vacuum Blend with your Vitamix! Vacuum blending is the latest development in blending technology, improving the nutrition, quality and shelf life of smoothies and other blended mixtures. The BioChef Vacuum Blender Container has been designed to work with the Living Foods Vacuum Blender. It is sold for people that need a spare or replacement container. It has also been discovered that the BioChef Vacuum Blender Container will fit most Vitamix Blenders, and will give you the ability to vacuum blend with your Vita-mix. Please be aware that the use of any non-Vitamix container may void your vitamix blender warranty. Vacuum blending is a revolution in blending technology for health enthusiasts that want to maximize the nutrition in their blended smoothies. The BioChef Vacuum Container + Automatic Vacuum Pump uses new vacuum blending technology to maximize nutrition and preserve freshness by removing the air from the blender jug prior to blending. The BioChef Vacuum Blending Pump Accessory quickly and quietly draws out the air from the blender jug before the blending process, preserving the nutrition and enhancing the flavor of the blended ingredients. The immediately noticeable result after removing the air and then blending is a richer tasting smoothie with a smoother, foam-free texture that can be stored longer with minimal flavor change. Food blended in the BioChef Vacuum Container will create smoothies that are noticeably brighter in color, has a smoother consistency, and stays fresh tasting for longer. The BioChef Vacuum Blender Container features a 6-pronged blade system made from Japanese stainless steel, with 4 serrated bowl-hugging blades and 2 central, smaller and upwards facing blades. The combination of the two types and directions of blades creates a funnel or whirlpool effect, drawing the produce up and over into the blades repeatedly. This is why this Container is able to grind grains, coffee and wheat into a fine powder. This super tough jug is shaped like a vortex creating a funnel effect for fast and effective blending, produce is drawn down into the blades in a continuous flow. This jug design is best designed for making smoothies and other recipes with a high liquid content. You shouldn�t have to sacrifice durability, style or function to experience the benefits of Vacuum Blending which is why the BioChef Vacuum Blender Container comes with a full 7 year warranty. Unlike any other accessory container on the market at present time, the BioChef vacuum container gives you the ability to break open the cellulose wall of fruits and vegetables and release their deep phytonutrients to make them more "bio-available" for our body to use due to the unique 6 pronged serrated stainless steel blade. At the same time, it preserves more of these valuable phytonutrients by having a lower oxygen content inside the container while under vacuum which prevents the oxidation damage normally found in standard blenders. With a touch of a button, the BioChef vacuum blending pump quickly and quietly draws out the excess air from the blender jug before the blending process to ensure you maintain the highest level of antioxidants in your blended creations. The built-in pressure sensor automatically shuts off when all the excess air has been removed. 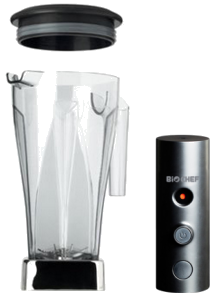 By pulling a vacuum on the BioChef blender container with the include automatic vacuum pump before blending, you will experience better flavored smoothies that contain less foam, a smoother texture, more vivid colors, less congealing, minimal loss of antioxidant phytonutrients, less separation, and better storage attributes. All this results in you and your family better enjoying your smoothies while getting increased nutrition at the same time. When it comes to your health, you want to be sure you are making the right choices! The BioChef Vacuum Blender Container is made from 100% Tritan Copolyester, a BPA free, impact resistant plastic. Why Vacuum Blend instead of Traditional Blend ? 1. Traditional blenders create greater oxidation due to the air inside the blender while blending. This causes food to brown quicker and diminishes certain antioxidant nutrients. Vacuum blending removes excess air and preserves freshness, nutrients and provides a smoother texture. 3. Higher nutrition. 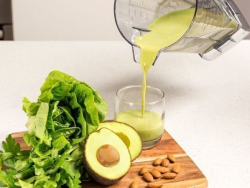 Based on testing, certain vitamins and antioxidants may be higher in a vacuum blender due to less oxidation to these fragile life-preserving nutrients. This BioChef Container will fit the BioChef Living Foods Vacuum Blender and should fit most Vita-Mix Motor Bases that use the standard 64 ounce Vita-Mix Container (as seen in the above video). This includes but is not limited to the following models: TNC, 5000, 4500, Turbo Blend VS; CIA Professional Series; Professional Series 200 (Pro 200); 5200 Super � Healthy Lifestyle; 5200 Deluxe � Complete Kitchen; Creations GC; Creations II; 1709; 1363; 1364; 1365; Total Nutrition Center; Aspire; 6300; Pro 300; Creations Elite It will NOT fit the newer Ascent Series (Smart System), Commercial Vitamix Blenders that use the Advance Container or the old 3600 model with stainless steel container.